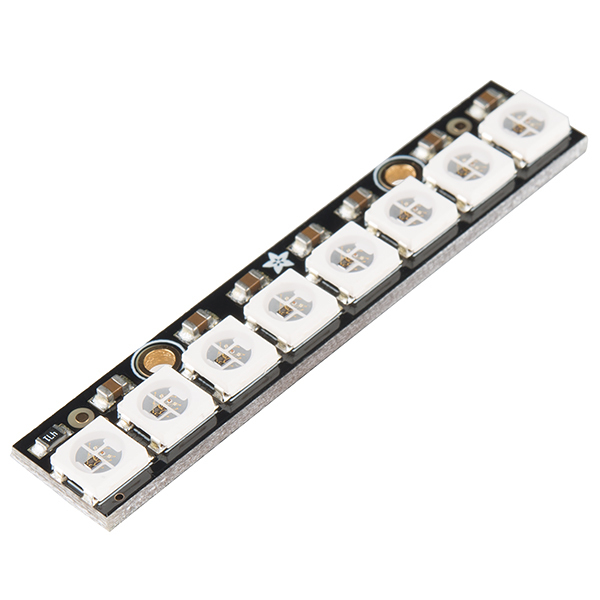 This is the NeoPixel Stick from Adafruit, a small chainable board with eight 5050 WS2812 RGB LEDs. 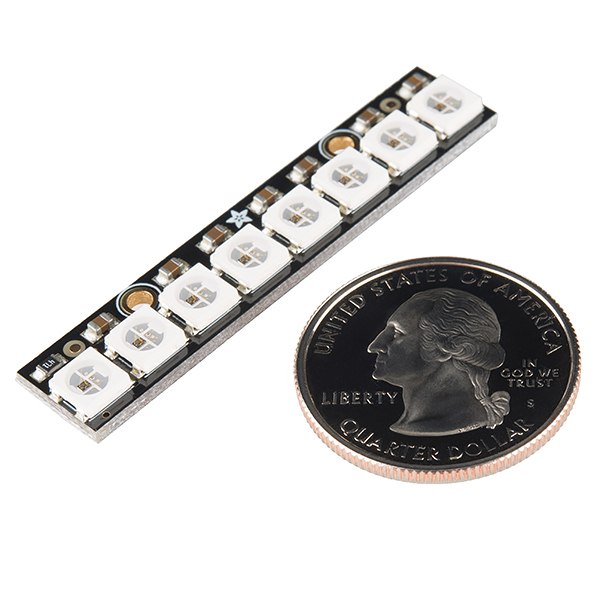 The WS2812s are each addressable as the driver chip is located inside the LED. Each NeoPixel Stick has ~18mA constant current drive so the color will be very consistent even if the voltage varies, and requires 5V. A word of warning about this (I posted it on the Adafruit site, too): Be very careful with the wires that you solder onto it. I've been soldering for nigh on to 5 decades now, including a lot of SMT stuff. (I'll admit I have trouble soldering anything smaller than an 0402 by hand, even with a good microscope.) Anyway, the wires I soldered onto the 8X stick (which I bought directly from Adafruit) have all pulled off their pads. I did not get them excessively hot or heated for an excessively long time. I was able to solder the wires onto the SMT parts on the "front side" and get the experiments done, and am OK with that. I soldered the V+ and GND to the bypass caps, and although I tried to get the Din wire onto the Din pin on LED1, I was unsuccessful, but did get it onto the Dout pin (more accessible), so was able to use the other 7 LEDs. (I'd already decided to use single Neopixels in my project, but since I had the 8x stick in-hand, I was able to "experiment" until I could get the singles.) I'll also admit that sometimes a panel will "sneak through" production chains with minor problems that lead to poor adhesion, so mine may be an oddball. Oh, yes: I also discovered (guess how!) that the melting point on the Neopixel LEDs is lower than that on a normal IC, so be careful with that soldering iron. Is dimensional data available on these boards? Any data sheets with spacing of mounting holes, board size, ect? What sort of "communications protocol converter" did you have in mind? Be careful and don't hold heat too long! The solder pads are not that well bonded to the pcb, use as low a heat as possible, when soldering, otherwise, an excellent product! The NeoPixel stick was very useful teaching my college class on Microprocessors. It was a very visual way to shift/set/clear bits especially for those very new to the 'guts' of a microcomputer. Plus, they're just fun. I really like working with these "smart" RGB LEDs (Adafruit NeoPixels and DotStars) because they make it easy to create a colorful lightshow using very little hardware apart from the microcontroller (I'm using the Arduino Pro Mini 328 and the Adafruit Trinket) and the RGB LED module(s). 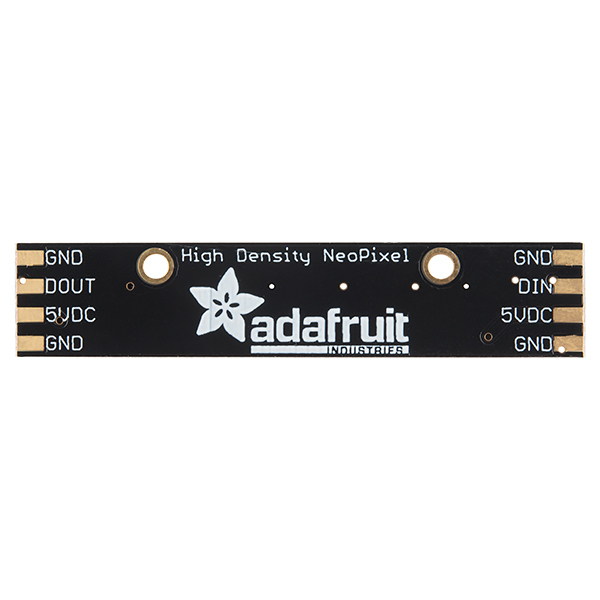 The only observation I can make about the NeoPixel Stick is a self-inflicted issue: I managed to cause some of the solder pads on three different sticks to lift-off the PCB rendering it difficult/impossible to daisy-chain another stick because of the absence of the Dout line. Edit â I hadn't read the post by the other customer who noted the issue with the solder pads before I posted my review. Boom I've got a Rainbow!